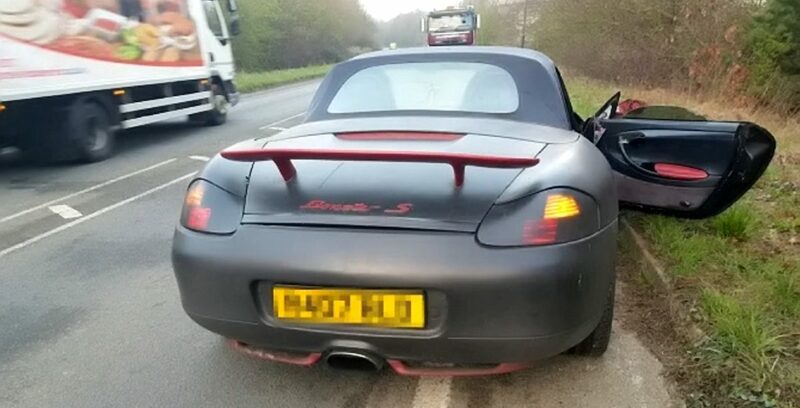 Police are looking for the owner of a customised Porsche that was abandoned at the side of a road after a hit-and-run. The matte black Porsche Boxster S was dumped by the side of the road after it crashed into a Kia. With a soft top hood and red trimmings, the distinctive car seems to have been abandoned after the prang, crashed into a Kia in Chichester, West Sussex, on Tuesday morning. The luxury sports car goes from 0 to 62mph in 4.6 seconds and has 345 brake horse power. A car meeting the exact specifications of the one police have described in the appeal was advertised for sale on Gumtree in Chichester one day before the crash. A new Porsche Boxster S can be bought new from £55,000 but the Gumtree car – which describes the deal as ‘cheap’ – is up for just £3,000. Chichester is around 13 miles from where the crash is said to have taken place in Wick. When called, the telephone number attached to the advert prompted an automatic message saying the call cannot be connected. A male driver allegedly collided with the black Cee’d on the A259 near Wick just after 6am while driving the Porsche. No-one was injured but the driver is believed to be uninsured and the Porsche has not been taxed as it has been declared off-road. The driver is described as being mixed race, about 5’7”, with short afro hair. It is believed he could be local to Bognor and Chichester as the car’s registration set off several ANPR cameras in the last few weeks. Sussex Police has been contacted for comment in relation to the Gumtree advert.